My assumption is that dogs vary so much in size because of artificial selection pressures coming from human breeders, but are there genetic loci that roughly determine approximate size? Do other feral species of animals exhibit such a wide range in sizes or is this something that only occurs when breeders intervene? This is a fascinating bit of genetics. Dogs are especially variable in size and many appearance, behavioral and temperamental phenotypes. It was long expected that variations in developmental genes were the reason that dog breeds were responsible for the amazing flexibility of dog sizes. One early locus found was IGF1 (insulin like Growth Factor 1). This 2011 PLOS paper actually review the specific genotypes of dog breeds and identifying loci that are strongly associated with breed phenotype supports this idea. ... (we scanned) the genome for signatures of selective sweeps in single breeds, characterized by long regions of reduced heterozygosity and fixation of extended haplotypes. These scans identify hundreds of regions, including 22 blocks of homozygosity longer than one megabase in certain breeds. Candidate selection loci are strongly enriched for developmental genes. We chose one highly differentiated region, associated with body size and ear morphology, and characterized it using high-throughput sequencing to provide a list of variants that may directly affect these traits. This theory has an intuitive appeal as well - no dog breeds (I think) are larger than the wolf, the stock from which all dog breeds are descended. All such breeds being derived from earlier developmental stages of the wolf makes an intuitive, if imprecise description of the effect here. Regardless, dogs remain an important model organism for so many traits because relatively few genomic regions can cause so many important phenotypes, including size, but also behavioral and morphological variations. 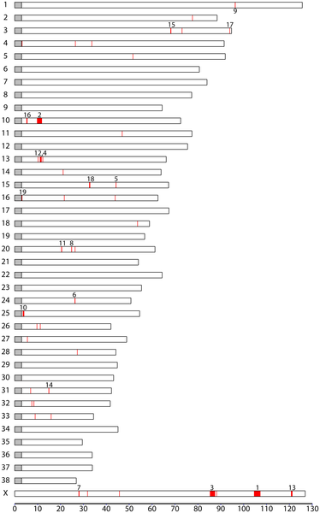 In the below figure you can see how few genomic regions are responsible for the 46 breeds Vaysee et al. examined. Not the answer you're looking for? Browse other questions tagged genetics anatomy or ask your own question.